This item is currently on backorder. Orders containing this item will ship as soon as we have the 1 L CarPro HydrO2 Concentrate in stock. Estimated ship date: 4/24/19. Check out the 100 ml and 500 ml that are in stock right now. Protect your paint for up to three months! Simply spray it on and rinse it off, no wiping necessary! The CarPro HydrO2 Concentrate (formerly known as HydrO2 Wipe Less Silica Spray Sealant) will protect your paint with as little effort as, spray on, rinse off! HydrO2 is formulated with hydrophilic glass fibers, silicon polymers, and fluoropolymers, which allow this product to be applied to all vehicle surfaces (i.e. painted surfaces, glass, plastic, convertible tops, wheels, calipers, wheel wells, trim, headlights, etc.). Make sure your car is clean and free of imperfections before you start. Then wet the entire surface of your vehicle with water. HydrO2's hydroelectric bonding function reacts chemically with water contact, meaning that this coating transforms from hydrophilic to hydrophobic once you spray it onto the wet surface. The pressure from the water stream when rinsing the surface helps accelerate the bonding of HydrO2, creating a hydrophobic layer of protection! That's right, there is no rubbing, buffing, or wiping this product into the paint! Simply dry the surface after you rinse and you are all set! The HydrO2 also offers a great value, dilute it at 1:3 (HydrO2 to Water) and you will have a wipe-less silica spray that lasts up to 3 months. 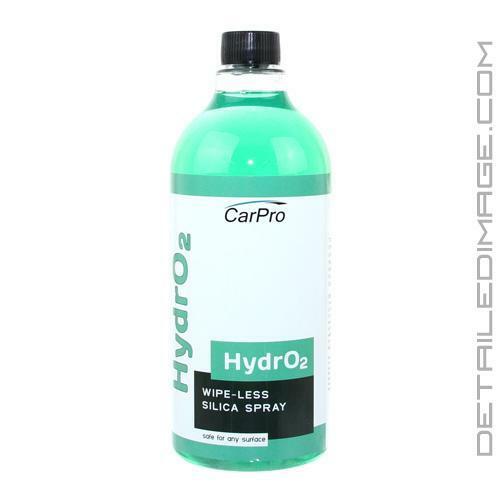 Grab a bottle of the CarPro HydrO2 Concentrate today and protect your car with one easy rinse! Want to skip diluting? Check out the CarPro HydrO2 Lite for a ready to use option! Do not use in direct sunlight. Thoroughly clean the surface to be protected. Do not use any type of wash and wax product as this will interfere with the bonding of Hydro2. Dilute 1:6~10 (HydrO2 to Water) into a spray bottle. Working on a third of the vehicle at a time (while it's still wet), spray a fine mist of Hydro2 directly onto the surface. Thoroughly rinse off using a strong jet of water. Continue this method until entire vehicle has been treated. Dry the vehicle using a clean microfiber towel (i.e. Waffle Weave Drying Towel) or car dryer, like the Metro Vacuums Blaster SideKick Blower. I go panel by panel, spray a door and then rinse with a strong stream of water. Move to the next panel and repeat until you cover the entire car. Then simply dry the car and that's it, you just sealed your car with Hydr02! HydrO2 makes it incredibly quick and easy to seal your wheels, no matter how complicated the design. HydrO2 will work its way into all of the cracks and crevices easily. In my personal experiences, I have found HydrO2 to perform well for 1-2 months on wheels. It simply doesn't get any easier than this! HydrO2 can be applied to your entire vehicle (wheels, paint, and glass) in a matter of minutes! There is no rubbing, wiping, or buffing required during application, and once applied, your vehicle will be a breeze to dry off. Simply flood or sheet the majority of water from the surface, and then blow the rest off with your Master Blaster. If you're looking for a true one-step process for washing and sealing your vehicle, HydrO2 Foam may be a real time saver! Wash and clean your car well. Spray section by section over the surface while it's wet. Remove any leftover droplets with MF. Very great product! Just make sure you dilute it well if not you will not get good results! This product is more for light protection and really doesn't make the paint any glossier in my opinion. Try to stay away from the sun when using, it is known for staining the paint and will have to clay or polish off. I have only use this product once and so far I am impressed. Immediately re-ordered once I used it the first time. Truly amazing product. Applies effortlessly with grade A results.